Boat House at Bastrup Lake. I went chasing the sunset one day a couple of years ago. I went to this place, called Bastrup Castle Ruin. It’s right next to Bastrup lake and it’s not that far away, and yet I have never seen it. It’s not always you get around, to go to see what’s close to home. Bastrup Castle Ruin used to be one of the strongest fortifications in northern Europe around 1100. It had an impressive 6m thick walls. 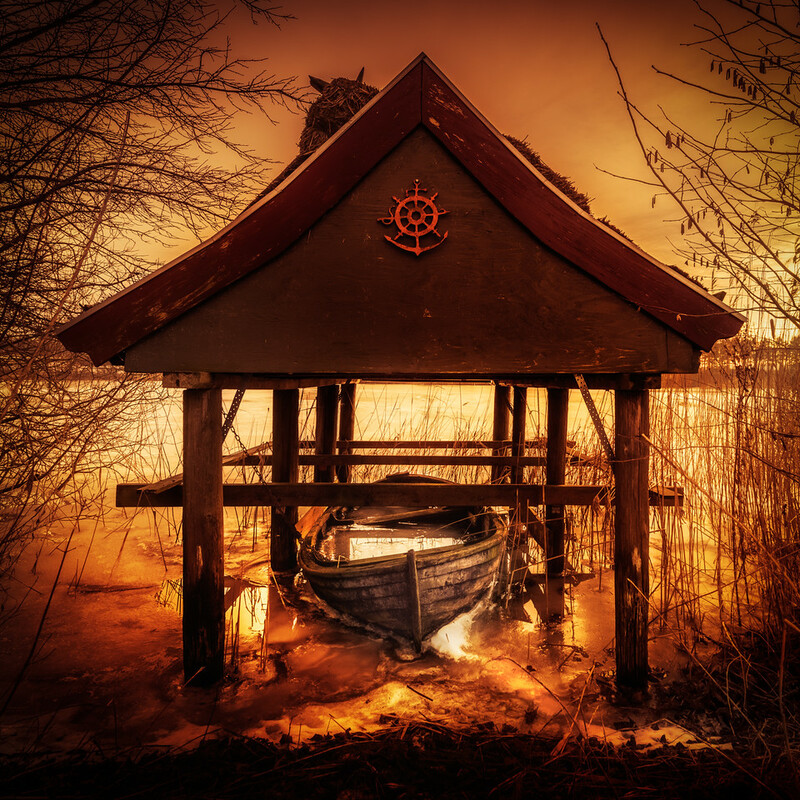 However, there s not much left of it, and I went searching for something else along Bastrup Lake, and I came across this little boat house, with an old boat inside. I wasn’t too lucky with the light, though. The sunset didn’t really work my way, and I never did finish processing any of them. I tried a few times doing this boat house, which I liked. Not until I tried this ‘Orange’ look, things started working my way. As you can see something quite different. Because I am shooting right into a pretty strong Sun, I have shot from -5 to +3, that is 9 shot’s, and merged them in Lightroom, using the new’ish HDR merge. I only normally only use this one, if I do not want to make any tone mapping. I often want to do tone mapping, because it opens up for a lot of creative processing. In this case, however, the orange look is created within Lightroom. The Orange Look presets will be available in my upcoming Lightroom presets.